I love when my parents come visit us. It gives us the best excuse to take them to try new restaurants and have slow mornings with homemade breakfast. In the nature of celebrating my birthday a week early while my folks were in town we took them to High Street on Market. We've been for brunch a few times now, always amazing and our dinner was no surprise. There are many reasons this place is Bon Appétit's #2 restaurant in the country. If you're in Philly, go. We've had this recipe waiting to go up for a while now. Backlogged with some other more seasonally driven recipes I kept putting these fancy nachos on the back burner. Finally, here they are. Completely appropriate for all seasons, any time. 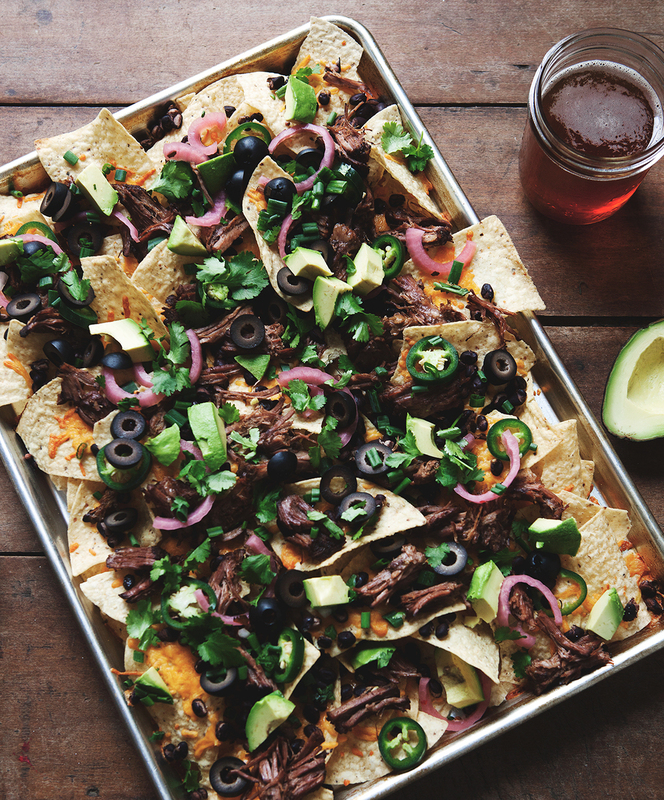 We made them for the Super Bowl, but they could certainly be a last minute addition if you're about to, or still... celebrating St. Patricks day. Preheat oven to 400°. On a large rimmed baking sheet, spread half of the tortilla chips and top with shredded cheese. Top with beans and steak. Add remaining tortilla chips on top and repeat with another layer of cheese, beans and steak. Warm in oven until cheese melts, about 5 minutes. Top immediately with picked onions, jalapeño peppers, avocado and cilantro. Serve with homemade pico de gallo (recipe to follow) and sour cream. Mix together all spices with a generous amount of salt and pepper. Rub steak and let sit at room temperature. On a grill over medium-high heat, sear all sides, approximately 2 minutes per side. Transfer to a large dutch oven over medium heat. Add beer and bay leaves, making sure to cover steak. Bring to a boil and reduce heat to low. Cover and cook, for 2-3 hours. Meat will be done with it pulls apart easily. In a medium saucepan, combine water, vinegars, and sugar. Bring to a boil. Meanwhile, slice red onion and place into jars or a tight sealing container. Pour brine into jars, making sure to cover onions completely. Add pickling spice and red pepper flake. Cool to room temperature and refrigerate at least 24 hours before serving. In a large nonreactive bowl, toss tomatoes with salt. Let sit 15 minutes and transfer to a colander to drain, discarding liquid. Return to bowl and combine tomatoes, onion, pepper, cilantro, garlic powder and lime juice. Season to taste with salt and pepper and stir thoroughly to combine.